You are here: Home / Trailers / We’re all going on a summer holiday, no more working for a week or two…” NOT YOU SPIDEY! We’re all going on a summer holiday, no more working for a week or two…” NOT YOU SPIDEY! Peter Parker is off on his holiday travels and we have three NEW posters to prove it: Berlin, Venice and London. 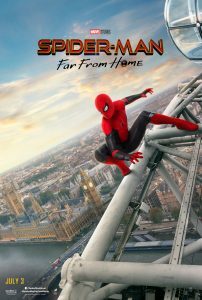 I need the official blurb for this one, as sadly I’ve never seen a Spider-Man movie. The movie stars Tom Holland as Peter Parker/Spiderman, Samuel L Jackson as Nick Fury, Zendaya as MJ, and Jake Gyllenhaal as Mystery. It’s directed by Jon Watts and is released in the UK and USA on 5 July 2019. Check out the posters below and scroll down for the first trailer, released in January.